Your condition as free men is in danger. Spain is invaded by the tyrants of all humanity, who want to maker her [into] another Abyssinia. All have decided to defend our future. [All have decided] never to tolerate this civilization of whip and axe on the neck of the workers. We must be generous in [the use of] force remembering the saying of the teacher Carl Marx: "The emancipation of the workers is the work of those same workers". 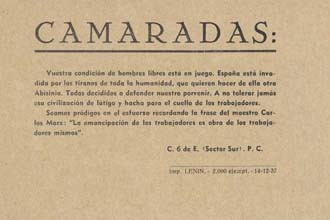 Between 1936 and 1939, the Partido Comunista de España (Sector Sur) printed and distributed small handbills, like this one, in Madrid. The people of Madrid, madrileños, were embroiled in a war with their fellow Spaniards. The Spanish Civil War had begun in July of 1936 with a military uprising in Spanish Morocco. Several, other uprisings occurred in cities across Spain. In Madrid, the uprising was defeated. As the conflict continued, individual uprisings merged into the coherent front of the Nationalist army under the command of General Franco. Miraculously, Madrid remained a Republican stronghold against the Nationalist forces that were sweeping across Spain from the West and South since 1936. Undoubtedly, a unified and highly motivated population played a major part in keeping Madrid free from the "tyrants of all humanity" to the bitter end of the civil war on April 1, 1939. Throughout the civil war, both sides of the conflict used propaganda in various forms to justify their political and social programs and to garner support for their side of the conflict. While the Nationalist government chose radio its main means of propaganda, organizations in Republican Spain, relied primarily on print and visual media for their war propaganda (Alted 159). This exhibit focuses on the printed ephemera of the Partido Comunista de España (PCE) and affiliated groups produced in Madrid during the Spanish Civil War. Throughout the conflict, the PCE emerged as one of the prominent organs of propaganda in Madrid and, in collaboration with other communist and socialist organizations as well as youth and women's groups, the PCE flooded Madrid with a barrage of printed ephemera throughout the war. In our own time, terms like 'propaganda' or 'propagandists' tend to have negative connotations. In a recent collection of historical essays on propaganda, Bertrand Taithe and Tim Thornton note that "propaganda [today] has been marginalized as a practice to such an extent that practitioners of propaganda now choose not to be labeled as such" (Taithe and Thornton 2). Yet, they stress propaganda as "form of political language" that "is always articulated around a system of truths and expresses a logic of exclusive representation" (Taithe and Thornton 2). Taithe and Thornton also note that the function of propaganda is "to convince, to win over and to convert" (Taithe and Thornton 2). In the case of the PCE in Madrid during the civil war, the printed ephemera seem to fit Taithe and Thornton's definition of propaganda and its function. Judging by their content, these documents served to convince madrileños of all types to participate in the war and to support for the Republicans against the Nationalist troops. These ephemera also attempted to construct the common political identity and ideology of anti-fascism under which all madrileños could fight together as a unified front against Nationalist forces. As war propaganda, these items have the potential to address several questions. What motivates people to go to war, to fight for an abstraction like a nation or a particular political ideology? How do governments and other organization use propaganda to motivate the population? These question remains a central area of inquiry for a wide variety of scholars from political scientists to historians to those interested in the used and effects of mass media. In most cases, it is difficult to determine the motivations or reasons why one individual or social group chooses to join one side of a conflict over another. This is especially true in historical cases. This lacuna in the historical record is often attributed to the fact that members of a society outside of the elite or educated classes tend not leave an extensive record of their thoughts and motivations. Moreover, this dearth of texts can be intensified during times of war when people's concerns often turn more towards survival and self-preservation rather than textual reflection. There are, however, some notable exceptions in which the letters and diaries of individuals have survived. While most historical actors may not have left us their first-person testimonies, we do have documents from the major groups in societies - in this case, the Communist Party and associated anti-fascist groups that emerged during the period of the Spanish Civil War. Thus, while we may not be able to determine exactly what motivated people to join the anti-fascist cause, these documents do reflect the rhetoric and main themes which the PCE deployed in order to draw people to its cause and motivate the people of Madrid to resist the invading troops. For this exhibit, ephemera were selected to reflect the widest range of ideological content as well as typographical styles. The ephemera in this exhibit address common war time issues such as the donation of clothes for soldiers, the building of fortifications and refuges, evacuation, making no compromises with the enemy, encouraging volunteers to enlist, and increasing production in the factories. These ephemera also served as advertisements for meetings and festivals hosted by the PCE and its affiliates. Many of these events featured speeches by prominent social and communist political figures in Spain as well as movies form the Soviet Union and local musical and theatrical groups. Although it remained a Republican stronghold for the duration of the war, Madrid eventually surrendered to Nationalists troops on March 28, 1939. It was at this moment that the whole country was giving way to the Nationalist insurgency and new era of authoritarian government was to began in Spain. Yet, the victory of Nationalist troops did not mean political homogeneity. A diversity of ideologies, undoubtedly, continued to thrive in Spain. However, their supporters had to be more cautious about expressing their opinions in the new political environment. As for the propaganda of the Partido Comunista de España in support of the Republican cause, the new fascist government under Franco, undoubtedly, shut down the presses - but only for a short time. When the production of printed material restarted in Madrid and across Spain after the Nationalist victory, the propaganda techniques and formats remained largely the same, only the content was different (Alted 159-160).